Well, now I will let you know about breast cancer. What is normal for you? normal breast are different each others woman. Most women say their breasts feel lumpy or uneven. The fat (subcutaneous adipose tissue) that covers the lobes gives the breast its size and shape. The way your breasts look and feel can be affected by getting your period, having children, losing or gaining weight, and taking certain medications. Breasts also tend to change as you age. Breast cancer is an uncontrolled growth of breast cells or breast tissue, which can occur in both women and men. Worldwide, breast cancer is the fifth most common cause of cancer death (after lung cancer, stomach cancer, liver cancer, and colon cancer). Certain Medications, Taking hormone replacement therapy (HRT) drugs after menopause may increase your chance of getting breast cancer. Personal factors, beginning periods before age 12 or going through menopause after age 55. The most important method used to diagnose breast cancer is by taking a biopsy (a tissue sample), The shape and appearance of the cells in the tissue sample reveals whether the lump is benign, which is true of the vast majority, or if it is cancerous. 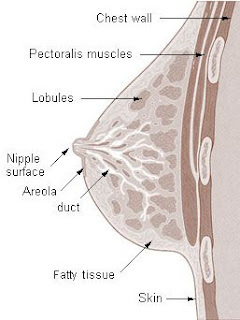 Ductal carcinoma in situ, is an early breast cancer in the milk ducts. It can be detected by mammograms and is normally easy to cure. Lobular carcinoma in situ, this is not considered to be breast cancer but a pre-cancerous condition. They just have an increased risk of breast cancer, so they are given frequent checkups. Invasive lobular carcinoma, is a breast cancer that starts in the lobules and has spread. It's may difficult to diagnose because they do not always form a lump or show up on mammograms. Radiotherapy, a highly targeted, highly effective way to destroy cancer cells that may linger after breast cancer's surgery. Hormone therapy, Sometimes called "anti-estrogen therapy (hormone-receptor-positive)". hormonal therapy blocks the ability of the hormone estrogen to turn on and stimulate the growth of breast cancer cells. Chemotherapy, is a systemic therapy. it affects the whole body by going through the bloodstream. The purpose of chemotherapy and other systemic treatments is to get rid of any cancer cells that may have spread from where the cancer started to another part of the body. Biological treatments (Herceptin), is a very effective treatment against HER2-positive breast cancer in women with stage II, III, and IV disease (medium to large cancers or cancers with lymph nodes involved or metastatic disease). Merci d'être passé par mon blog, d'autre part, médicalement parlant, votre blog m'a l'air très interessant et le problème c'est que j'ai beaucoups de mal avec l'anglais! To determine the size and the position of the heart chambers, a physician will use an ECG. He will note also the heart activity such as the rate and regularity of heartbeats. The ECG helps also detecting if there's a heart pathology and the effect of medicines and heart devices (pacemaker) on the heart. Thanks For Sharing Very Useful information Breast cancer. Great Information Thank You For Sharing It.